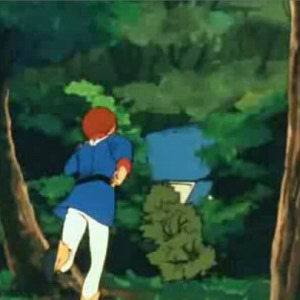 Guess which bush Amuro pushes aside. Dean: Whoa, hold on. Check out that book. Fred: There are a lot of books in here, Dean. Dean: No, that one. The one that isn't painted into the background of the car —[coughs] — library. In some cartoons, it is obvious that a part of the background will be used. What makes it obvious is that it is strikingly lighter in color than its surroundings. It might also have an obvious difference in detail or color saturation. Another telltale sign would be clear black outlines on the object: the three clearly outlined rocks on the cliff would be the ones to tumble. A similar situation is where things that should move don't, because they are made a part of the background to save time. This is an unintentional artifact from the traditional, celluloid animation process. This was largely because, besides being painted by different artists at different times/locations, already making consistent matching difficult, each foreground/animated object would require up to hundreds of different drawings, as opposed to backgrounds/matte paintings, which each only needed to be done once. Therefore devoting any more than basic color saturation and contrasting light values would only make the process even more lengthy and time consuming than it already was. Additionally, the unpainted portions of cels were not perfectly transparent, so the colors on lower cels became more and more muted as additional layers were added to the top of the stack. Film critic Roger Ebert has called this the "Fudd Flag", after Bugs Bunny's nemesis, who uses it to determine which tree Bugs is hiding behind, which rock he needs to trip over, etc. Nowadays, digital ink-and-paint and compositing has largely displaced the use of painted cels, meaning that colors can be matched accurately (although conspicuously light patches are still pretty common in cartoons with digitally inked-and-painted foregrounds and hand-painted backgrounds). The issue of lavish backgrounds contrasting with simple animated elements remains to some extent, but it is often avoided. Many TV cartoons now use backgrounds rendered in the same simplistic style as the animation, while theatrical films can now use CG to render "background" elements that can be animated... which can lead to a whole new set of problems. Something similar occasionally appears in older live-action productions. In particular, you may see an oddly colored sheen around the characters in shows featuring heavy use of Chroma Key. In his review of the Star Wars prequel trailer , Mr. Cranky dubbed this slight Special Effects Failure a "mystical aura." The technique has since evolved to the point where it is mostly no longer noticeable. Mostly. This also applies to mid-era point-n-click Adventure Games, when the background would be painted or 3D rendered, while objects would usually be drawn sprites. However, this had a practical use, allowing players to easily locate collectible objects, even small ones. Especially small ones. A similar version can appear in action games that require you to destroy parts of the environment to proceed, again, mostly in older ones. The breakable parts would usually be a different color, and one can sometimes even see the seams where the object is supposed to break apart. In early console games, some interactive objects might use a noticeably different palette than the background, since sprites and backgrounds have their own color spaces. Also, it may be used intentionally in video games to help point out certain objects or items, and often in different form than the accidental style mentioned above but the same spirit (something that looks out of place in a minor way that reveals it to be important) most often as a Notice This. Occasionally inverted by allowing the cel/object to exist and making it readily visually apparent, and then moving the background art instead of the cel. This trope is particularly prominent in cartoons made during The Golden Age of Animation. With the modern trend of flash animation, there is almost no difference between backgrounds and cels, completely averting this trope altogether by the fortune of new technology. The Touhou doujin-anime Musou Kakyo: A Summer Day's Dream has this almost constantly. When the elephant eats bricks on Black Cat Detective. 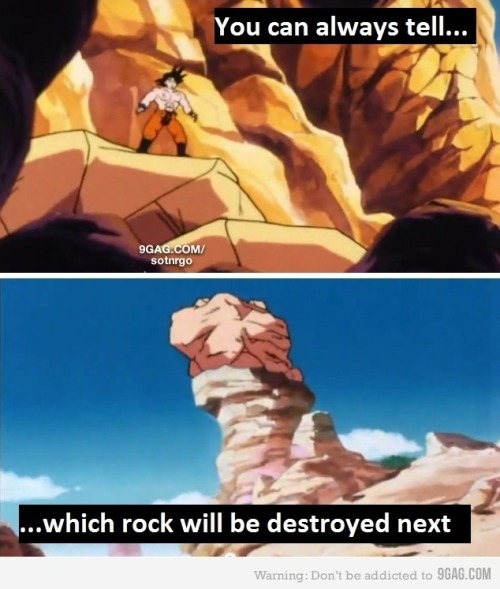 Dragon Ball Z had it, though not as bad as some other cartoons of the era. For example ◊. Quite obvious at one point in YuYu Hakusho, when the part of the Saint Beasts' castle is collapsing. Parodied in episode 15 of Pani Poni Dash!. When the bus is teetering on the edge of the cliff, every external shot of the cliff shows the edge of the cliff very obviously animated this way, indicating that the cliff is about to crumble. It never does. In the episode of Digimon Adventure 02 with the Dark Ocean, Kari is at one point inside a tunnel when part of the ceiling collpases. The bricks that fall are a shade lighter than the ones that don't. Which raises the questions as to why a cat would stay perfectly still and quiet on a shelf for longer than necessary while two strangers enter its temporary residence. The book Belle checks out at her village's library during the song "Belle" at the very beginning of Beauty and the Beast. Several of the older animated Disney films would occasionally have characters for some reason be drawn as a background rather than on a cel. Examples include a closeup of Monstro the whale's eye in Pinocchio, a giant Alice's leg (and bloomers) sticking out of the White Rabbit's house in Alicein Wonderland, an unconscious Princess Aurora lying on the ground after touching a spinning-wheel in Sleeping Beauty, and Ariel's tail at one point during the song "Under the Sea" from The Little Mermaid. During the "Baby Mine" scene from Dumbo, when we see the montage on baby animals and their mothers after Dumbo and Timothy visit Dumbo's mother still in the cage, a mother zebra for some reason actually has her head drawn on an individual cel while her body is drawn onto the background! (her colt is also drawn on an individual cel). In the German animated film Felidae, when Francis is running away from some cats chasing him, he runs out on a plank balanced by a heavy sack. You can tell this plank is going to fall because it's drawn on a cel, rather than painted like the rest of the background. Glaringly obvious in Felix the Cat: The Movie, though it's the least of your worries given the film's numerous problems. Nostalgia Critic: Look out! It's painted into the background so I know it isn't going to do anything! In How the Grinch Stole Christmas!, most blatantly during the end scene where the Grinch is cutting the roast beast, not only is each slice cel-animated, but each slice cuts and looks identical — and the roast never gets smaller. Many Seuss-based animated films suffer from this effect. The ant-infested tile Judge Frollo picks up in The Hunchback of Notre Dame. Also played with in the same film with the gargoyles, who appear as matte-painted until they come to life. Inside Out: The memory shelf that collapses to reveal the recall tube has something different about its color scheme compared to the surrounding ones. Lilo & Stitch uses this deliberately as part of the art style, as all the characters are cel animated on top of watercolour backgrounds. In The Lion King during the elephant graveyard scene, all background bones are dark grey but animated bones are a light cream color. Don Bluth's The Pebble and the Penguin does this several times in the film, but this becomes the most obvious during the climatic battle between Hubie and Drake at the end, where the cel-shaded pieces of staircase are the ones that Drake punches away while trying to attack Hubie. In the climatic fight scene in The Princess and the Goblin Curdie rushes to get a sword from the weapons room. It's extremely obvious which weapon he's going to pick up because of this trope. While the characters' fairly straightforward animation is understandable in contrast to the sumptuously painted backgrounds, when something in the background needs animating, it can be rather jarring. The mud sloshing around the Brisby's house as they're trying to move it is particularly obvious. Plus the scene where Mrs. Brisby pushes out the water dish to escape the cage. It changes between static painting and movable cartoon in every edit. The same is true with the latch Nicodemus uses to open his cage - it also switches to a hand-drawn cel just after zooming in. The video game Serious Sam, interestingly, features these. Behind a lightly colored spot on a wall, you could expect to find a secret by moving to it or shooting at it. Conspicuously Light Patches, along with other texturing and lighting tricks, were a staple in FPSes since Doom, as they were often a clue to where a secret could be, or where monsters would come from. The newer, Crystal Dynamics-developed Tomb Raider games constantly use white ledges to signify which parts of the wall Lara can grab. The older games didn't need these hints, as they were more obvious due to simple landscapes. In the first Mass Effect game, you would sometimes come across rows of weapons lockers in merc bases, and the only hackable locker would be a lot brighter than the rest. Games and Mods based on Quake-derived shooters such as Half-Life have this quite often, based on rendering limitations, until dynamic shadows became more prevalent in engines starting in 2004. Lighting effects were determined when the level was built, and didn't change during play, even if an object moved to a differently lit environment. Similarly, interactive objects didn't block light, meaning a bright light would shine right through a door or destructible wall as though it were glass. Levels had to be designed with the limitations in mind, by having near identical lighting on both sides, or leaving the light off on the opposite side until it was triggered. It's the case with most games that used the aforementioned lightmap model. In most cases dynamic objects and static models or map scenery would be treated differently lighting-wise - the LS3D engine used in Mafia: The City of Lost Heaven used dynamic shadows for characters and moving lights, but everything else is pre-baked. In the final mission of San Andreas, "End of the Line", the player is required to ram through a fortified wall using a SWAT APC. The breakable segment of the wall has a noticeably light tinge to itnote Due to how the building's lighting is baked during development but dynamic objects aren't., and its textures don't line up with the rest of the building. Same case with part of the bridge rail where Tenpenney's firetruck crashes through. Certain scenery such as pillars in the Majestic Hotel in Grand Theft Auto IV were made to take damage, with chunks flying off upon gunfire. A close look at these pillars will reveal subtle yet noticeable seams that make up the structure. In Super Mario Bros. 3 brick blocks with jumping Goombas hidden inside are easy to distinguish from ordinary bricks, as the enemies don't have the "shine" effect normal bricks have. Invoked in the LEGO Adaptation Games, where non-LEGO scenery serves only as background. All interactions involve only LEGO items. Epic Mickey deliberately invokes this as a homage to old cartoons. Toon objects, which can be affected by Paint and Thinner, are bright and colorful, while Inert objects look dark and menacing, and cannot be painted or thinned. Each level in Yoshi's Island for the SNES had 20 red coins, disguised as and placed among regular gold coins. However, if you look very closely, you'll notice that the disguised red coins have a subtle red tint to them, which makes them easy to distinguish from the gold coins once you know what to look for. This trick doesn't work in the GBA port. In several Kingdom Hearts games, destructible obstacles have a different look from the rest of the landscape. In Golden Sun and its sequels, using certain Psynergy powers will cause the background to turn monochrome ... except for items that can be dealt with by hand or affected by Psynergy powers. In Far Cry 3 the drugs you can take in the cave are a distinctly different shade of red from the rest of the bowl. When you walk around in Pokémon Ruby and Sapphire you regularly run into some odd looking trees on a colored square background, in contrast to the trees around them with proper alpha channeling. if you poke the tree, it folds up and a Ninja pops out to challenge you to a battle. Cuphead plays this one completely straight as a throwback to 30's animation that made heavy use of this; in this case, it serves to mark the actual objects you can interact with in the World Map. Mega Man 8 has a very weird shot in the animated cutscene where Duo explains evil energy, where his head is drawn on a cel and the entire rest of his body is a background object for some reason. Dark Souls 2 uses a lighting engine which seems to use different values for NPCs and static objects - due to the washed-out filter and generally harsh lighting, this doesn't become particularly obvious until you encounter a Mimic in a dark room surrounded by real chests and spot it immediately because it's about five shades brighter. Back to the Future: In "Gone Fishin'", the section of a cliff that collapses under Young Emmett (or, in the changed timeline, under Marty) has a rather obvious black outline while the rest of the cliff is a painting. Subverted (perhaps unintentionally) in one Roadrunner cartoon, where Wile E. Coyote cuts a suspension bridge that's clearly drawn on a cel, but the fully painted cliff he's standing on falls instead. "Falling Hare" does it several times, but it's most noticeable on a section of a wall that Bugs Bunny backs up into in order to ram open a door. An episode of Extreme Ghostbusters featuring "The Piper" had this exact trope. When the characters were standing on the pier, one could see the foreground planks in a richer shade of mahogany shortly before they were smashed to pieces. The New Adventures of Alvin and the Chipmunks had this all the time, from a door that was shortly going to be opened, to a boulder that was going to fall down on the heroes. In the animated feature American Pop, one character is seen playing the piano, and as he moves his arm his sleeve repeatedly flickers to a lighter shade than the rest of his shirt. DuckTales (1987) has a title sequence example, in which Scrooge pops his head out of a lightly colored patch of gold coins. In the 1991 Tintin series episode "Cigars of the Pharaoh", the inside of a cigar box is shown. The cigar which Tintin picks up is quite clearly drawn on a cel, whereas the rest of the cigars are obviously part of the background. Scooby-Doo: Trap doors, curtains hiding monsters, vases that activated secret passages, paintings with moving eyes, it was everywhere. Quasi-subverted in the theme song, however, with an obviously-background-painted Scooby-Doo covered in bubblegum, which is cleared away by an animated tongue to reveal the lighter, animated Scooby. In the second episode of Avatar: The Last Airbender, the snow wall Sokka is standing on has plenty of these, including his snow watch tower, which collapses as Prince Zuko's ship approaches. In He-Man and the Masters of the Universe (1983) you could tell which rocks were going to fall as they'd be coloured lighter. In Gargoyles, there was a scene where a blind man pulls out a book from his shelf. All the other books are generic browns and reds, the one he pulls out is bright blue. For the aversion, see below. Although the ones in older episodes could be attributed to the fairly small budgets at the time, the newer, more Nickelodeon-backed episodes have no such (weak) excuse. One particularly egregious example is the episode "Can You Spare a Dime? ", where SpongeBob pokes Squidward's animated nose, and the entire rest of his head is a much-darker matte painting. Also in "Bossy Boots", the squeeze toy on Mr. Krabs' desk looks painted just like the background, then it turns a lighter color when he actually picks it up and squeezes it. However, it was averted for the most part in "Pressure". When Sandy knocks some rocks loose to stop SpongeBob from beating her at a rock climbing competition, the rocks she moves are matte for almost the entire time until they actually begin falling. CatDog, for example in the taco restaurant in the episode "All You Can't Eat" where CatDog crawl under the floor tiles and you can see the path they take outlined on the tiles. Arthur is prone to this, at least in the earlier episodes. For example, Arthur frequently visits the library, and it's pretty obvious which books he'll take off the shelf. Visible, though subtle, in the early SWAT Kats episode "The Giant Bacteria", at the very beginning, parts of an oil refinery blow up, and you can tell which is which ahead of time. They had it far less subtle most of the time, however, as the backgrounds were drawn in a rather lavishly detailed style reminiscent of a comic-book, but the animated pieces were less "stylized", and more similar to other animated series of the time. During the "Planet Song" from Animaniacs, the planets Venus and Saturn are for some reason both drawn as individually-animated cels, while the other planets of the Solar System (Uranus is completely absent due to Yakko Warner accidentally leaving it out) are all drawn as backgrounds. In The Amazing World of Gumball, objects characters interact with are animated (typically in a medium matching at least one person using it) while background objects are live-action. Every single object and animals in WordWorld that's shaped like its name. Parodied in Harvey Birdman, Attorney at Law. During a "special showing" of a Birdman episode the series is based on,note While it is an original Birdman episode, the cast of the parody series provide a humorous re-dub. Harvey is shrunk by Reducto; facing ants that now match him in size, their antenna are colored differently and are the only parts that move, to which Harvey notes it appears to be all they can do. Tom and Jerry had this pretty badly. It was quite easy to tell which objects were going to be broken or picked up and used by the characters by the distinctly different shade that they had. A subversion with the "Happy Helmet" episode of The Ren & Stimpy Show. When Ren goes to the kitchen to find something to take the happy helmet off with, he stands in front of the cupboards with one drawer drawn differently than the others, but he doesn't open it right away. After a scene change, the camera switches back to the kitchen, and the entire cupboard is drawn differently with no clue as to which drawer he might open, only then does he open the one that the previous scene alluded to. In the Batman: The Animated Series episode "The Terrible Trio", the daughter of a recent victim is sitting by her father's bedside when a nurse comes in and tells her she should get some rest since her father isn't likely to wake soon. Considering he's significantly more detailed, and therefore part of the background, the nurse is probably right. Seen in many space films, actually. Exterior shots of the Leonov in 2010: The Year We Make Contact have an aura, most noticeable when the ship moves toward the camera. Likewise, small ships in the original Star Wars trilogy are often surrounded by a light rectangle, particularly in VHS and earlier DVD releases. While Back to the Future Part II and Back to the Future Part III did chroma-key well (managing to disguise, for example, when the flying DeLorean was actually a model), the original had two obvious Special Effects Failures: When the car first disappears, leaving the fire trails; and when Marty's hand begins to fade in front of his face. There's a particular bit in the 80s Flash Gordon movie where, as a rocket travels forward entering the Imperial Vortex, this bright, transparent... thing moves behind it. Instead of moving steadily behind the rocket, it sort of jumps whenever the rocket's going to go past it. Hitchcock's classic North by Northwest has the climax take place on the front of Mt. Rushmore. If you look very carefully in the moments in which you can see the full monument, you can see the blue-tinted line. In the B-Movie Xanadu, Sonny gets one as he enters the muses' world, as seen at the bottom of this page . "... think about every alien artifact or creature you have ever seen. Weren't they always surrounded by a crackling nimbus of blue light? [...] Didn't they sometimes look a little ... unconvincing?" The Adventures of Superman used greenscreening as a budget-saving technique for the flying scenes. One shot of Superman was filmed against a variable backdrop, and as a result, he gained a mystical aura every time he had to fly somewhere. Some special effects failures let you see the characters were suddenly in front of a blue screen such that someone was going to do something that required a special effect to depict. Due to the way the widescreen version was produced you can spot the picture quality drop with every effects shot in Babylon 5 on DVD, at least on a good quality TV setup. The Chroma Key used in El Chapulín Colorado wasn't very sophisticated, so you could notice the people or objects that were added to the image with that technique because they were both strikingly light and had a green aura on them. This is particularly noticeable in the haunted house episode, where some characters start speculating at the possibility of objects levitating - it happens to be at the same time you notice an object that looks off, which ends up levitating. Lampshaded on The Daily Show. During the 2004 election, a segment is done with Rob Cordry lying handcuffed on the street, with an extremely obvious Aura. After the segment, Jon Stewart comments that it "looked like the street was melting away from him." Doctor Who: In Jon Pertwee and Tom Baker's eras, the use of Chroma Key for lasers and ray guns meant that whenever a character was about to shoot their gun in a shot, they'd be surrounded by the mystical aura. Extremely apparent in some Muppet productions, as Jim Henson liked using Chroma Key a lot in the mid-80's. It gets to the point where you can tell something's up when you see that "mystical aura" around a character. Done intentionally in the "Secrets of the Muppets" episode of The Jim Henson Hour. Henson explains how the room he is hosting the show from is blue-screened, then holds a bright blue necktie in front of himself, making his chest transparent and demonstrating the Chroma Key technique. And then subverted later on. Jojo (the Audience Surrogate) claims that he can now tell when Chroma Key is being used. When a Doozer from Fraggle Rock enters the room, he claims that it's obvious the character isn't really there, and is probably about three feet tall and standing in front of a blue screen somewhere. Jim then picks up the Doozer, demonstrating that it is actually a radio controlled puppet, and then begins the segment on how characters like that are made. Happened occasionally with objects Al would walk through on Quantum Leap, or even Al himself. Objects that are interactive but would not otherwise be obvious glow in the video game Call of Cthulhu: Dark Corners of the Earth. In Metroid Prime 3: Corruption, anything you can use the Grapple Lasso on shimmers yellow, while ledges you can jump to and pull yourself up onto shimmer green. In all three of the Metroid Prime Trilogy games scannable enemies and objects are Color-Coded for Your Convenience to tell you if you have scanned them or not. Justified, as Samus's visors are equipped with a Heads-Up Display and her suit holds an internal computer. The Power Suit is highlighting these things for her. Crysis does the same thing as Metroid when tagging hostile targets. The game frequently has quests where you have to pick up objects on the ground. These objects are scenery and can't be manipulated (and don't even light up when the cursor hits them) unless you're on the relevant quest. Since finding which book among the thousands of books you see in a building is the one you're supposed to pick up is annoying, Blizzard eventually made quest objects sparkle and glow to make them easier to discern. A variation on this is used in at least a couple of places, including the mines underneath one of the Mana Forges in Outland and during one of the Harrison Jones quests in Uldum. Dead NPCs that will spawn additional creatures lie on the ground. The ones that will spawn creatures use a different model and are rendered in higher detail than other "background" elements, making it very easy to tell which bodies will spawn mobs. Happens in most MMOs sooner or later, thanks to Players Are Morons (sort of justified on the side of the developers, because only the players who can't find the items will write long ranty bug reports saying finding the objects is impossible). It's come full circle in Star Wars: The Old Republic, where interactive items have a blue-tinged sheen to them, ordinarily conspicuous enough. But on snowy planets like Alderaan or Hoth, lighting gives everything a blue cast, meaning the player could glimpse a security chest out of the corner of their eye... nope, just a rock. In City of Heroes, items that must be found to complete a mission not only pulse with light, but emit a sound to alert players to their presence, earning them the nickname of "glowies" among players. This falls under the category of Acceptable Breaks from Reality. The "glowies" in didn't originally include the sound clue for finding them, but since some were tucked into corners and nearly impossible to locate by sight alone, the sound effect was added to relieve frustration and reduce GM calls. You can alter the file and make them emit any sound you care to, if the "wom wom wom" noise is too disruptive or irritating. Final Fantasy VII had the point-and-click-adventure-game example of this trope. Any object, person or thing that could be examined or otherwise interacted with was rendered in rather blocky 3D (mind-blowing at the time, but extremely dated now, decades later) against the smoother, less-dated pre-rendered backgrounds. In fact, the main character remarks on it once or twice in the Beginners Hall. Even more obvious in the PC version, in which the backgrounds are still 320x240 but everything else is in high resolution. Want to know if a corpse in the PlayStation-era game is just a corpse or if it's going to bite your legs off as you walk past? Just check whether it's rendered like the background or like a character model. Smooth-shaded = dead dead, jagged polygons = zombie. Not nearly so easy in the GameCube remake, however. The increased render capabilities make the zombies blend in a lot better to the remade backgrounds. Occasionally the series will fake you out, though, with a polygonal body that doesn't get up and try to eat you. Occurs with other objects as well, such as doors, paintings, etc. as they're usually noticeably brighter and more jagged than background objects. If a door looks like this, you can bet something'll come crashing through it sooner or later. Averted with breakable windows, which are hidden surprisingly well. One level featured enemies who hid in brick blocks; the blocks concealing enemies were easily distinguishable because, due to palette limitations, they didn't shimmer the way that normal blocks did. Naturally, in the Super Mario All Stars remake, there was no such giveaway, due to the SNES' more advanced graphics capabilities. If you pause the game, though, enemies are not drawn. So if you see bricks disappear...now you know. They're still a slightly different color in All-Stars, though that's probably intentional. Another example would be underground hidden blocks — on the NES, the starry background would be a noticeably (though not too noticeably) different color where a hidden block would show up. No dice on the SNES. The ROM Hack Mario Adventure adds random weather effects to every outdoor level. For whatever reason, the weather effects wouldn't appear where there was an Invisible Block, making many puzzles perhaps easier than they had been intended to be. Near the end of World 8-3 of the original Super Mario Bros., if you look very closely at the last brick wall in the background (it's behind the last Hammer Bros. there) before the flagpole, you can easily tell that one of the bricks making up the wall contains coins. What makes this obvious is the fact that the coin brick has a thin white line drawn above. In the SNES remake however, that brick is completely visible all the time as those walls have been removed and placed in a different background. The "different palette" version shows up a lot, albeit unplanned, when playing a monochrome Game Boy game on a Game Boy Color or Game Boy Advance. Backgrounds are colored green and sprites are colored red. Fortunately, there's a couple different palettes you can choose when turning the game on that negate this effect. In The Legend of Zelda: Ocarina of Time, the area of floor you have to bomb in order to reach King Dodongo uses a texture that doesn't quite mesh with the floor around it; if you look closely you can see the seams. Also, the rocks that you can bomb tend to be very obvious, as they all use the same model. If you see a patch on a wall in Mondo Medicals that is lighter than the rest of the wall, you can walk through that part. This is key to solving many of the game's puzzles, including "Counts to Fifteen" (15 is hidden behind one of the walls). While The Secret of Monkey Island featured pixel-art backgrounds that meshed convincingly with foreground elements, backgrounds in the second and third were hand-painted. This was mostly averted; items that could be picked up were often also hand-painted and pasted in, and disappeared when you picked them up. This convention was completely thrown out in Grim Fandango and Escape from Monkey Island, in which everything is 3D but the backgrounds are all pre-rendered and, more importantly, not anti-aliased (except in the Grim Fandango remaster). So just look for the items with jaggedy edges. Circle of Blood averted this; everything (everything) was in the same cartoonish style, including things two or three pixels wide that you needed to pick up. People took to calling it Circle of Mouse because if you didn't mouse over every pixel in a new area, you missed something. Conspicuous in King's Quest VII: The Princeless Bride, the first SVGA King's Quest game, where the cartoonishness of interactable objects, in contrast to the backgrounds, sometimes make it ludicrously easy to figure out that, say, a statue is actually going to come to life and kill you. By extension, in almost every 90s Sierra adventure game you could tell what elements of the scenery were potentially inventory by the fact that they were lighter in color and simpler in appearance than the hand-painted backgrounds. This was practically the only way to figure out which items were inventory in some rooms. In Pokémon Red and Blue, Koga's Gym has "invisible walls" that you have to find your way around to get to the Gym Leader. The tiles with "invisible walls" on them have four white dots, allowing you to find the right path fairly easily. This was most likely intended as a hint for players, since it's not hard to make a tile have the properties of a wall but the image of a floor. It still wasn't THAT easy, since you sometimes walk into dead ends. In all of the Pokémon games, places where you can use HM moves stand out, from a different kind of rock being breakable, rocky slopes that can be climbed, and dark patches of water that serve as Dive spots. 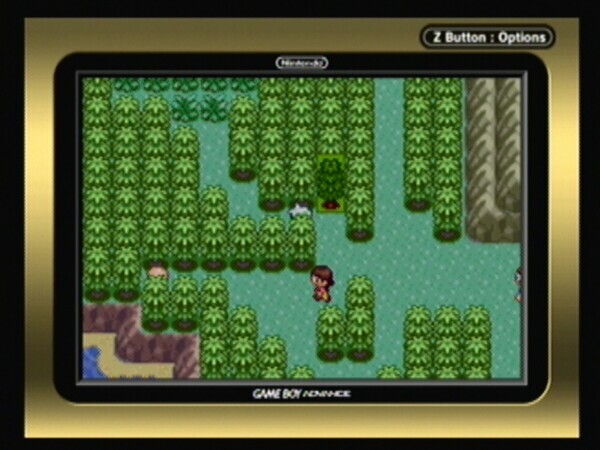 Not to mention the Ninja Boy ◊ trainers disguising themselves as trees in Ruby, Sapphire and Emerald. Occurs often in Kingdom Hearts. If there's an object that looks like it's not stuck onto the scenery, chances are it's an important tool for continuing the game. Fallout: New Vegas has one companion perk which causes certain items to glow when the player aims. Useful in some of the darker caves and buildings. A related phenomenon occurs in Half-Life 2 and its episodes, where objects that aren't anchored to the environment — and can therefore be picked up or at least punted with the Gravity Gun — have sharp, flat-colored shadows as a side effect of the limited lighting engine. This is of limited usefulness, since the developers were quite thorough in ensuring that virtually everything smaller than a pickup truck is a physics object. The anime Blue Seed has an omake sequence after one episode which parodies this; one character stops and monologues on the properties of a set of desk drawers, noticing that one is drawn more simply and in a different palette — therefore it must be the only one that moves, and contains the item he is looking for. In the same sequence, Matsudaira warns Kunikida not to step on a part of the cliff that was colored differently. Instead, the more complex part of the cliff collapsed. Inverted in Nausicaä of the Valley of the Wind, where the titanic Ohmu insects are made up of animated backgrounds. Averted in Spirited Away; the art book points out that CG was used to animate the dishes when Chihiro's parents start nudging them around with their pig snouts. Mystical aura is spoofed in Cloudy with a Chance of Meatballs with the Mayor's ad for Sardine Land, in order to make it all the more crapstastic. Ironically, since the film is made with state-of-the-art CGI, it took a bit of doing to properly simulate the look of bad Chroma Key. Discussed in episode 11 of The Fallen Gods when the only information Mara gives the party on what she wants from a wizard's Tower is "you'll know it when you see it". They decide that this trope will be how they spot it. The creators of Doom 3 made a point of rendering both fixed and dynamic objects the same way for this reason, among others. The original The Legend of Zelda has identical dungeon walls whether a bomb will punch a hole in them or not. Fortunately, only the middle of any given wall needs checking. The overworld is far trickier, since bombable walls always face south, but otherwise can be in any location (when checking, keep in mind that bombing between tiles can let you hit two walls at once). Spoofed in Telltale Games's Point-and-Click Game Back to the Future episode 3. A bricked-up doorway features a obviously discoloured brick, the only selectable object upon the surface. It's just there to have Marty make a joke about it being "another brick in the wall". Subsequent clicks confirm its useless nature, with Marty commenting that it is just a brick. Peasant's Quest subverts the game version. At one point in the game, a conspicuously light candle appears on the screen. If you try to get it, the game says "It seems like you should be able to do that, doesn't it? Sorry. No dice." Spoofed in one of the first few screens of Space Quest 3. Using the parser to try and examine a very inconspicuous object gives a message along the lines of "We know what you're looking at, and we assure you, you don't need it." In one of the first screens of Space Quest 2 there was a suspicious square of grass outlined by dots, concealing a Pit Trap. The command "look at trap", which only worked on this screen, would tell you to stop being paranoid. Crunchy Bunches made fun of this in one comic. Pegasus: The only way to defeat him is with a special card that I've hidden somewhere in this room. Think strategically, though. Where can one find an extra card? Yami: Well, that's obviously Pot of Greed over there. Kaiba: How can you be so sure? Nobody even knows what Pot of Greed does! Yami: And neither do I. But I can tell it's that one because it's animated differently than the rest of the stuff in here. Animaniacs made fun of this. In one episode, the Warner Brothers (and Sister) were rented out to a Hanna-Barbera-esque company, and placed in a Yogi-Bear-esque cartoon with plenty of these. The Animals of Farthing Wood averted this by having certain objects painted on the animation cels so that the characters could use them without them looking conspicuous beforehand. In Gargoyles the animators worked very hard to keep the stone gargoyles from being Fudd Flags. When stone, the gargoyles are in background animation, appearing as any other inanimate object. When they come to life, they are in cel animation. Naturally, this trope is back to being played straight whenever somebody needs to move a stone gargoyle, but that doesn't happen very often. Parodied in an episode of Harvey Birdman, Attorney at Law (which is animated digitally) when Apache Chief picks up a telephone pole and it's suddenly a different color from when it was a background object. Lampshaded, as with other animation tropes, on the OK K.O.! Let's Be Heroes episode "Your World is an Illusion". Holo-Jane tries to explain to K.O. that his world isn't real, and has him pick up one of two pebbles on the ground. One is in a lighter color, while the other one is more rendered and clearly part of the background. K.O. instinctively picks up the lighter pebble, but when Holo-Jane asks him to pick up the other one, he finds himself unable to. Averted in The Simpsons by painting the backgrounds on cels, same as the characters. It succeeded most of the time, but there were still tell-tale "Fudd flags" visible at times until the production switched to digital rendering methods. SpongeBob SquarePants inverts it with the robot waiter in the episode "No Weenies Allowed", which (except for its claws) is a painted background object whenever it appears. According to the artbook, the show's background artists deliberately make some background objects stick out even though they don't move. It's an attempt to make backgrounds more lively, based on a theory they call "threat of activation". You populate the world with little details that you design and paint like props, like they're on cels. And since the audience at least subconsciously knows that drawings on cels are probably going to move, you create this illusion that those things could move, even if they never do! A subtle joke in "Sadie's Song": Sadie offers to let Steven choose a stuffed animal from a large pile. It looks like he's about to choose one that's a blatantly different style and color from the rest, but then he refuses. In the Unikitty! episode "Hide N' Seek", Richard, being so monotone that he people flat out don't realize that he's there sometimes, is drawn in some scenes as literally being part of the background, with his face rendered onto a separate, albiet less detailed, layer. It is not as jarring as some examples, as he is simply a grey LEGO brick in design. There's two pre-Chroma Key examples in William Hartnell stories. In "The Keys of Marinus", it's obvious when the characters are going to use the teleportation devices, because they move in front of a completely black square of backdrop to do it  usually disguised as the inside of a doorway, but sometimes just a random black square hanging around for no reason. The effect of the seed shrinking in "Planet of Giants" also takes place in front of a completely black panel in the TARDIS that was not there before and is never shown there again. It's quite easy to tell in the Classic series when a Dalek is going to get a severe thrashing, because it stops twitching its eyestalk, gun and plunger beforehand, due to there being no human inside for obvious safety reasons. This is especially noticeable in the scene where the TARDIS crew and the Thals storm the Dalek city at the end of "The Daleks" due to the minimal amount of editing possible with the No Budget conditions, so motionless Daleks are on screen for a surprisingly long time before Ian runs up to them and kicks them. In "The Dalek Invasion of Earth", you can even tell which Daleks in a group are going to be attacked by which ones aren't moving. In "The Claws of Axos", one of the TARDIS roundels is inexplicably blue. Of course, later in the scene it is CSOed into becoming a viewscreen. In "Dark Water", a spare TARDIS key is hidden in a book which looks much newer than any of the other books on the shelf with it. In the "Conky" episode during the vet clinic scene, Randy and Lahey get shot with tranquilizer darts and Conky the hand puppet's head is blown apart with a gunshot while still on Bubbles' hand. The show is a mockumentary normally shot in long takes with handheld cameras, but these effects would of course be impractical and unsafe to try and achieve in real time on a low budget, so they're rather obviously shot in extreme close-up with stationery cameras instead.